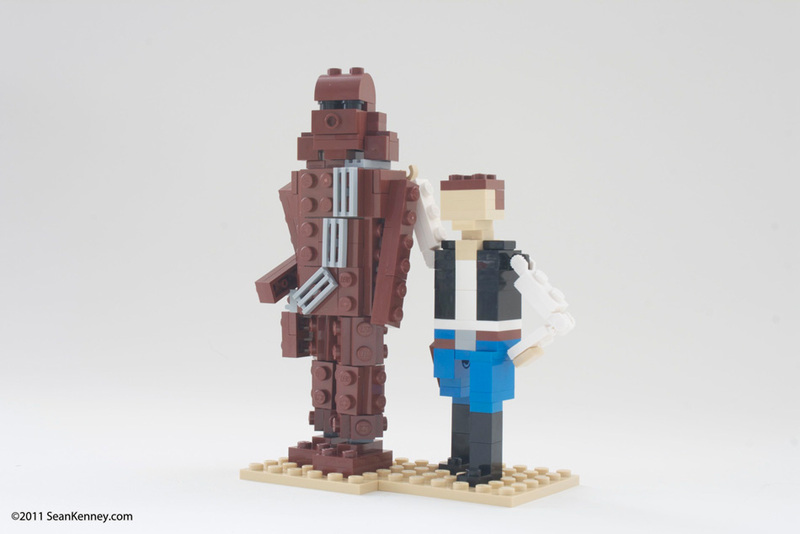 These miniature figures of Han Solo and Chewbacca were designed by LEGO Master Builders for the new LEGOLAND Star Wars. LEGO asked me to glue copies of them for their 2011 Toy Fair celebration event. They were packaged up as premium give-aways for guests at the event. Each Chewbacca contains over 100 pieces, and each Han Solo contains over 50 pieces. LEGO wanted me to glue (drumroll) ... 125 pairs! Does that sound like a lot? All 125 sets of figures contain .... (drumroll) .... (longer drumroll) ... (still drumrolling) ... over 20,000 pieces! The figures took hundreds of hours over two full weeks for me and a team of two assistants to assemble and glue. Darn walking carpet!